Welcome to the latest edition of road.cc’s buyer's guide to inexpensive cycling shoes in which you’ll find everything you need to know to find the right sensibly-priced shoes for you, plus our pick of 11 of the best cycling shoes under £50. In this updated version of our guide to inexpensive cycling shoes, we've added Shimano's ME2 SPD shoes, Decathlon's new Triban RC 500 shoes and the Diadora Trivex II road shoes. Cycling shoes have stiffer soles than, say, trainers or running shoes, which makes them more comfortable to pedal in. You can pay hundreds of pounds for high-tech shoes with carbon fibre soles, but you can get perfectly usable shoes for under £50. As Mat Brett discusses at length in our article covering everything you need to know about cycling shoes, there are broadly two types of cycling shoes: road racing style and SPD/mountain bike style. SPD/mountain bike style shoes have a small cleat (a special stud) recessed into the sole. They're easier to walk in than road racing shoes and because the pedals are usually double-sided they're easier to get into. They're the way to go if you want to get started with clipless pedals. Road racing shoes have stiff, smooth soles with threaded holes for a cleat that stands proud from the shoe and fits into the attachment mechanism on a matching pedal. They're efficient and secure, but there's a learning curve to getting in to the usually single-sided pedals and the shoes are hard to walk in. Let's see what we can find by way of shoe bargains. These shoes from French-based sport store chain Decathlon look like a bargain entry point in cycling footwear. They're billed as road shoes, but have a two-bolt mounting for mountain bike-style cleats, so you'll be able to walk in them easily. 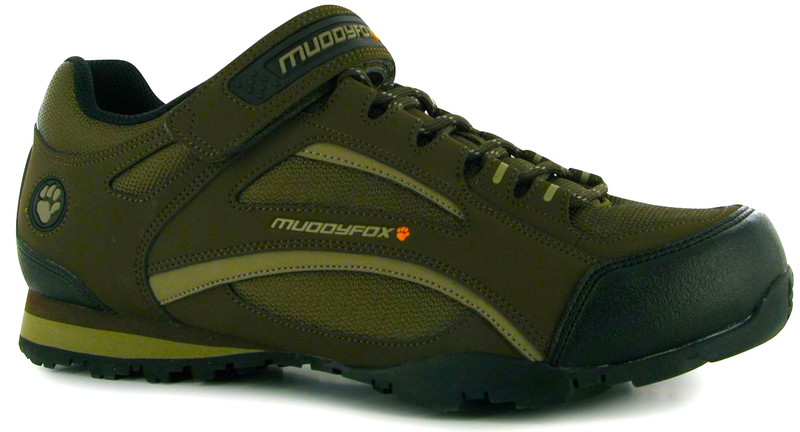 Thirty quid now seems to be the starting price for cycling shoes and these from Sports Direct brand Muddyfox are typical of what you'll find. You get a padded mesh fabric body, with laces and Velcro strap to cover the knot and lace ends and a cushioned heel outsole for walking. Shimano invented the SPD shoe and pedal (it stands for Shimano Pedalling Dynamics) and in the 25 years since then the Japanese component giant has got very good at making shoes for the system. There's a glass fibre reinforced nylon shank in the sold for rigidity, but the whole sole is cushioned for comfort. A lace closure means you'll have to be a bit careful about tying them so that they're clear of the chain. As well as the black here, they're also available in blue, and there's a women's version too. The sole of these mountain bike shoes has a deeper tread than the MT34s, for grip on dirt, but there's a continuous raised section around the cleat for easy walking. The sole is reinforced with glass fibre for stiffness. The latest shoes from Decathlon, these have a two-bolt sole for mountain bike style cleats so you can walk in them easily. They look just the job for touring, commuting and even club runs. They're also available in all black, or with blue or red in place of orange. With a simple three-strap closure and composite-reinforced sole, these racing shoes from top Italian brand Diadora are perhaps a shade pricey at their £90 RRP. For £40, though, they're an absolute steal. These three-strap shoes from Shimano are compatible with both two-bolt and three-bolt cleats. The sole is glass fibre reinforced nylon and is designed for indoor cycling as well as riding outdoors. The upper is made from mesh and synthetic leather and has extra cushioning for comfort. Built on a fibreglass-reinforced sole for stiffness, these three-strap shoes have reflective highlights for visibility. Mavic's shoes are known for their comfy fit and durability, so this is a decent deal for entry-level Mavic kicks, though we have seen them for under £50. They're compatible with two-bolt SPD and three-bolt Look-style cleats. Wiggle customers are very happy with their RP1 shoes, praising the fit, comfort, sole stiffness and faff-free two-strap closure. The sole gets its stiffness from fibreglass reinforcement and there's a reflective patch on the back for visibility. They're compatible with two-bolt SPD and three-bolt Look-style cleats. My eyes! It's okay, these budget road shoes from Muddyfox are also available in a snazzy white, red and black colour scheme for those who aren't sufficiently extrovert for screaming neon. They have a two-strap closure, with a very broad strap across the top to spread the tension over your foot, and Amazon reviewers say the sole is plenty stiff. For just £30, they do the job. With a fibreglass-reinforced nylon sole and classic trio of Velcro straps, these road shoes from Decathlon look to be very good value. They'll take either three-bolt cleats or two-bolt SPD cleats. Muddyfox Tour 100 Low Cycling Shoes were what I bought when I wanted to try clipping in but did not want to spend a lot of money to find out it wasn't for me. These shoes lasted just long enough for me to find out that it was for me (2 weeks). Completely false economy, I then got the shimano ones that were £15 more and they are still going strong 2 years later (they are refusing to die and I really want to start wearing the new shoes I bought). In the interests of fairness, I did exactly the same, and my first pair of Tour 100s lasted well over 2 years, and I was so pleased with them I bought another pair to replace them when they wore out. That second pair is now reaching the end of its useful life (again 2 years or so later) and I will likely get another as they have given me not trouble and no reason to look elsewhere. I own one pair of bike shoes - the cheap(ish) Nike ones that I bought in 2003. The velcro closures on each shoe came adrift at differnet times, and each was replaced at the local cobblers for a few quid. 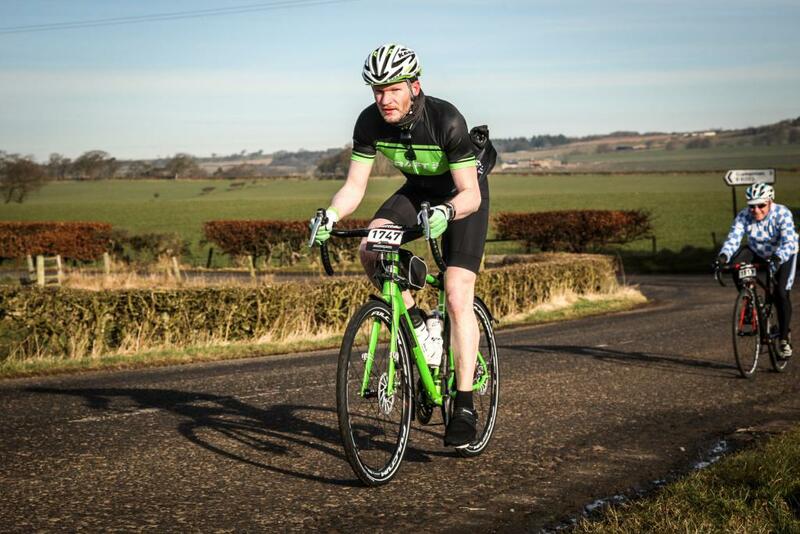 Admittedly I am a leisure rider but apart from years with a significant injury do about 5,000km a year, all year round. Perhaps I should treat myself to a new pair this summer? Interestingly, they came as a package with some Look delta pedals. I have been through four sets of pedals in the lifetime of the shoes (Cheap Deltas made of plastic wore out, second pair of Deltas got to the point of chronic, uncurable squeaking, switched to SPD-SLs and left the first pair behind on an overseas visit so replaced them with the same). Any suggestions for cheap shoes with laces only? For the vintage ride. Dhb make a lace up own brand shoe. Mavic Aksium II aren't 2-bolt SPD compatible, they only take 3-bolts. The tour versions of the Aksium and Ksyrium shoes are, but they seem to have stopped making them, annoyingly as they're pretty much my go-to shoes - decent road shoes that work properly with 2-bolt SPDs and have enough of a tread that you can actually walk with them. I've yet to find anything as good. I have the DHB aeron carbons, and I'm happy with them. They are a big size, as Wiggle say on thier website, so most people will need to go a size down. My existing shoes were 43 and a bit tight, so I stuck with 43 and the fit in the aerons is good. My only criticism is that the inners offer no support at all to the instep of the foot - they are very flat. I have just ordered some superfeet carbon inners to go in them, which I am hoping will provide some more support on longer rides. I've done a few 100km+ rides wearing the new dhb Dorica lace-up shoes (I'm using the ones with the MTB sole). In my opinion Wiggle missed a trick as they should have been marketing these for Audaxers or "Gravel Riders", these are great shoes at a really good price point. They're not overly stiff, but as a result, "hike a bike" or walking is reasonably comfortable and the cleats are fully protected. My white shoes have a few scuffs and dirt on them, but have cleaned up OK and look great on the bike. I found the same thing with my DHB Aerons. I has improved with wear, but the biggest improvement was after I started listening to my coach's advice, and dropping my heels instead of riding very toe-down. such a pity that the BTwin shoes only cater up to size 11/46. Most other makes now cater up to and beyond size 14 so why wont they?